What a busy summer! Been enjoying the outdoors and coming up with new ideas for Happy First. So here I am, back to blogging! 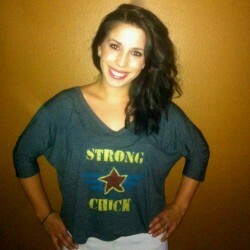 We have been working for months on our newest tees, Strong Chick. Some of you remember our contest last winter where people picked the next “chick” tee. One of the top finalists was Ally Boulas who wanted “Strong Chick” and wrote about her mom, Pam Dominesse, an Army major who was in Kuwait for 2 years starting when Ally was 8 years old. Check out the “Strong Chick” blog post to read her story. We loved it and want to help families in the military. We thought this would be a great time of year to honor them, as November is National Military Families month. We are going to donate to military families with a portion of sales from these tees. Details will be coming soon. So after months of designing, here are our first 2 tees. We have one more coming soon. Last week we celebrated a good friend’s birthday and Latife Myers (pictured) and her mom, both good friends of mine, were at the lunch. I showed my friends the tees, they were hot off the press. Everyone loved them! (yay!) Then we realized Latife’s story would be perfect to share. So it was pretty spontaneous, she took some pics and wrote me this note. Love it. Exactly who we want to honor. I can’t express how much it thrills me that you have made a t-shirt for all of the strong women in this world, especially those serving in the military and those with a spouse, or loved one who serves. This t-shirt hits very close to home for me and my family. As you know my husband Dylan Myers has just finished his contract with the Marine Corps after four long years as an E-4,with Bulk Fuel Co. We have been through 3 deployments in the last four years. Oef 9.1 and Oef 10.2 (Operation Enduring Freedom),and the third a humanitarian mission to Haiti after the earthquake. Having a spouse or loved one in the military not only means sacrifice and strength, but it also means having a whole new family, with a completely different bond than any other. Throughout my four years of being a “military wife” I have met so many people that have impacted my life in ways I could never imagine, having that bond with my husband and his fellow marines is something I will always cherish and carry with me throughout the rest of my life. Having this shirt to share with the wives and the friends that we have made throughout this journey will only keep a tight knot between us even tighter. Thank you again for representing the strength we need while all of our loved ones are gone, I am extremely lucky and proud to have my husband home and safe with me, and I wish the best to all of those who need that strength right now in their lives. So do you all know any other Strong Chicks out there? Are you one? We are looking for stories from people with a connection to the military. Let us know why you or a friend are a Strong Chick. Write on our facebook wall at our Happy First facebook page , email us, or comment below. Would love pics too! ps-click on the pictures to take you to the Happy First website to get more details on the tees. 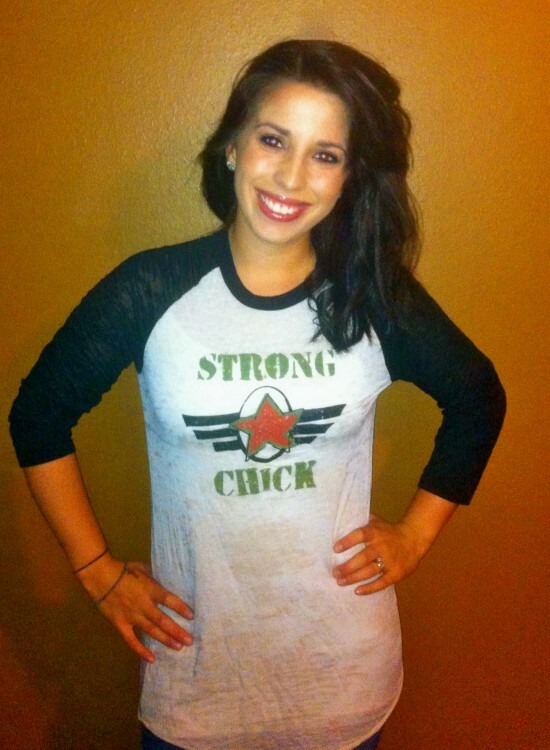 And Strong Chick is designed for anyone to wear, you don’t have to have a military connection to be a Strong Chick! We all are strong in different ways.